Heat water in a pot and add potatoes and cook for 8 minutes before adding pumpkin and cook for another 2 minutes. Drain from water. Heat olive oil in a pan and add onion and a pinch of salt and cook for 1-2 minutes until onion has softened slightly. Add garlic, ginger, mustard seeds, chilli flakes and Dahl recipe mix, add more olive oil if pan seems dry. Stir through and cook until mixture starts to become fragrant (1-2 minutes). Add pumpkin & Potatoes and toss through to coat everything evenly. Add water and cook down until sauce has thickened. 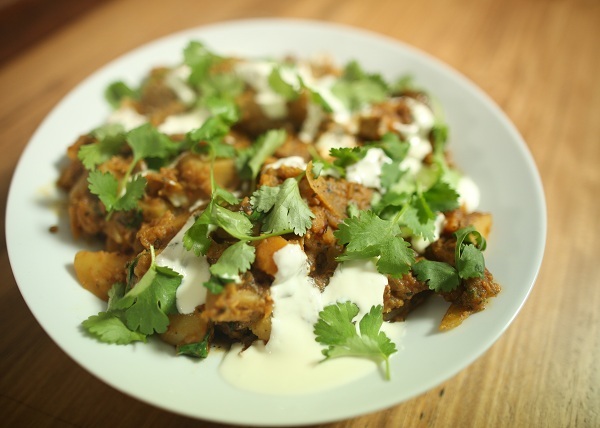 Just prior to serving, mix through half of the yoghurt and half the coriander. Garnish with yogurt and coriander when serving.